A sails ability to hold the designed aggressive aerodynamic profile in use, and not allow fabric stretch to generate all sorts of ineffective shapes is dependent on the fabrics construction and quality. Advances in weaving technology, melamine finishes together with high strength (modulus 100+) fibres have allowed traditional woven dacrons to close the performance gap to laminated sail fabrics. However all woven fabrics have crimp in the yarns , (the under and over interlacing produced by the process of weaving ) this stops the load bearing yarns from laying straight and therefore resisting stretch at initial loading. Laminates have the advantage here with straight non crimped yarns. The durability of dacron is its main advantage. The premium dacrons should not be confused with low cost production sailcloths often found in imported sails. On larger yachts the heavier weight of dacron required compared to laminated fabrics is an important factor as sail area increases as a square of the yachts length. A dacron sail will be 20% to 25 % heavier than a comparable ,durable laminated sail. 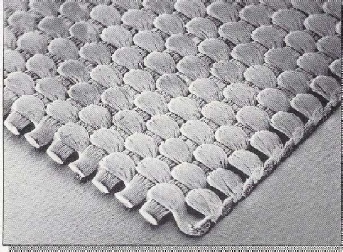 the process of weaving dacron is interlacing the warp (fibres that run the length of the roll) with tight weft (fibres run across the roll) , this produces less stretch along the straight weft yarns compared to the warp, so usually cross cut is the best panel layout for dacron sails to make use of this extra strength up the highly loaded leach. The taffeta (a light weight woven fabric ) is laminated to the outer mylar film to add abrasion resistance, durability and some strength but also weight (typically 15% ) so is usually found on the leach areas of sails where rigging contact is likely, the front of the sail being of lighter film on film construction. This transparent film acts as a base for the bonding glue and controls local stretch in laminate sails ,responsible for the glassy or transparent look to sails. manufactured by extruding liquid dacron into very thin sheets. colour tints are added for UV light protection ie grey or blue. Modulus of 1000plus comes with the baggage of limited flex life, fibres tend to break down to the more common form of carbon, black dust when abused. 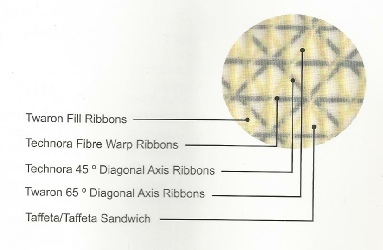 By twisting the carbon with spectre/dynema before laminating flex life is improved and the fabric withstands shock loads better, development work on carbon is producing better fabrics that are the lightest possible for a particular application . Modulus of 950 means very low stretch, nine times stronger than dacron, allows considerable weight saving with laminated racing sails as less fibre is used, modern tinted films have controlled the problem of UV light effecting strength but at least 25% strength loss due to flex has to be allowed for when designing sail if a reasonable racing life is to be expected. As the name suggests a multi layer fabric of mylar film then load bearing multi directional fibres (the yarns of which are dead straight for minimum initial stretch) then another layer of film all glued or laminated together under extreme pressure, results in a very light weight almost transparent sail fabric. Mylar film is measured in mils thickness, for durability look for 0.75 mil either side, total 1.5 mil on yachts over 10 metres length.